When the Dublin Port Tunnel opened, they inaugurated it with a 10k fun-run. 5k up one tunnel, 5k back the other one. I did this for a laugh. A once-in-a-lifetime opportunity to go for a run somewhere that was built to be un-runnable. And I wasn’t in awful shape when I did it. I could comfortably run about four or five kilometers without taking a break. You know, not bad for an enormous fatass. When you come out of the tunnel, you’re just in the middle of nowhere1 on the M1. There’s nothing to see. But when I came out, there were people on the bridge above the motorway. People just came out on a cold, bleary day to cheer a bunch of people they didn’t know. They even hung a banner - “YOU CAN DO IT”. That broke me. I started welling up and completely lost my stride. And that’s because I am a complete sucker for this kind of thing. I think it taps into something deep inside my lizard-brain. Some really basic emotions. These people could have stayed at home in their nice, comfy houses, with their feet up. But instead, they came out in the cold to cheer a load of out-of-shape people they didn’t know, just to tell them they could do it. That was strangely powerful. Whoever is doing the copywriting for Nike is doing a great job of tapping into that same feeling. I’m struggling to get into shape (or rather, a shape that isn’t ‘round’) and I’m watching this ad almost daily. It’s cynical emotional manipulation by a heartless corporation, to be sure, but that doesn’t mean it can’t be a little bit beautiful too. And then there’s this. Who wrote this? Most companies would be happy to leave it to the app’s programmer to write something insipid and bland like “You beat your previous record”. 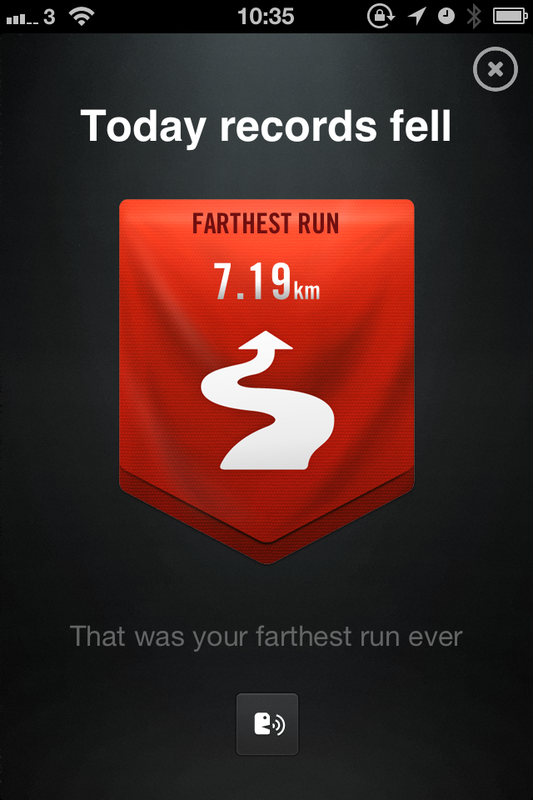 Because let’s face it, running 7.19km isn’t really an achievement for most people. It doesn’t need any extra effort or thought. But for me (and people like me), it was huge. It was epic. And I just love the fact that they use epic language to describe it.